We at Select Sand & Gravel strive to assist customers with Sand, Gravel, Rock, and Dirt projects. 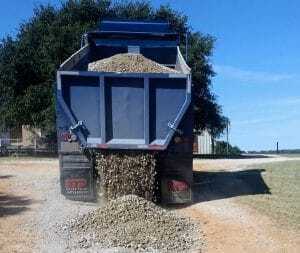 Examples of the projects include: Gravel Driveways, Roadbase Driveways, as well as, other uses for Topsoil, Dirt, Crushed Rock and Crushed Limestone Rock. Our customers include the Commercial Contractor or Residential Customer who is in need of Sand, Gravel, Rock, Dirt or Topsoil material to successfully complete the task at hand. Specifically, this article is to help inform those who may be interested in the construction of a road base driveway or gravel parking lot. In Texas, there are a number of materials that are readily available and can be successfully used to create a stable, drive-able surface. The main materials that are used in this region are crushed limestone rock, recycled crushed concrete rock, crushed river rock, caliche, recycled asphalt, crushed granite, and decomposed granite. This is by no means an exhaustive list but it would comprise the primary list of materials used in this region of Texas. Click this link for images relating to the above materials. This article will not discuss how important it is to think about drainage around your drive or parking area. It is important to note that poor drainage makes it very difficult to maintain your driveway. The better the drainage, the longer it will stay intact. Later, we will provide an article discussing in more detail the finer points of drainage as it relates to construction projects. Generally speaking when one creates a driveway or parking lot surface it is very important to use a road base material first. That is a material that is comprised of one of the previously mentioned substances such as crushed limestone rock, crushed concrete rock, etc. Additional details regarding the differences between Crushed Limestone Rock and Crushed Concrete Rock can be found at another article on our site, titled, "Crushed Limestone Rock versus Crushed Concrete Rock". That material must have both crushed rock of at least 3/8" in size going all the way down to the crusher fines, which is the rock dust that is produced when the material is crushed. you might ask, why would one want rock dust in your driveway? Well, it can be messy at first but without the dust the roadbase has no way to bind together. When factoring in how much material you will need it is suggested that at least four inches in depth be used for personal vehicle traffic and six or more inches for commercial vehicle traffic. The more material that used, the longer the road will last, without requiring repairs. When installing roadbase, equipment is recommended. Such as using a piece of equipment like a skid steer or backhoe. The material is very dense and would be very difficult to work with by hand. Spread the material in the desired area to at least four inches thickness. Once you have spread the material then come in behind with a roller or compactor and compact the material thoroughly. Once this process if completed, wet the material down and allow at least two days to dry. Once the material is dry it will now shed water. It is also a good idea to gently slope the material from the center of the road out to the edges so that water will run to the sides if possible. It is not necessary to put down weed guard underneath the roadbase because weeds will grow in the material itself. However weed guard can be used on top of the base. Then apply a two to four inch topping of clean crushed rock that would finish the project. The top rock will provide great traction for any vehicle that drives on the surface and the week guard will prevent any fine material that is in the base from seeping to the top when wet. One step that many contractors skip in the driveway / parking lot construction process is compaction. It is particularly important that this process NOT BE SKIPPED. We have heard frustrating stories about how people have paid money to a contractor to build them a road base driveway and within a year or less it has fallen apart. It is our opinion the main reason it has fallen apart is because the contractor has skipped the compaction and wetting process. When this occurs the driveway simply will not hold up for the long haul. We at Select Sand & Gravel are always here to help. Please contact us at our office numbers for a free estimate or for any additional information. © 2018. Select Sand & Gravel. All rights reserved.